Smart Urbanation collocated with 6th Smart Cities Summit is India’s leading platform for government and private stakeholders. The Economic Times ACETECH is a leading trade fair in Asia for architecture, building materials, innovation and design. ACREX India would return to Mumbai to celebrate its 20th edition, where the mega event will witness participation from more than 25 countries. Confederation of Indian Industry (CII), India's Premier Industry Association is organising Excon 2019 which is scheduled to be held between 10th - 14th December 2019. The 6th edition of UBM India’s, Concrete Show India, concluded in May 2018 with over 150 Indian and global suppliers and manufacturers from across 10 countries. 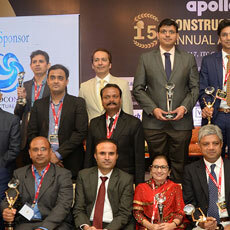 he CONSTRUCTION WORLD Architect and Builder Awards were instituted by ASAPP Info Global Group in 2006.